I have been having few debates with colleagues on the topic of Talent and talent ID programmes. Due to the success of some talent transfers in some physical sports, there seems to be a large number of people convinced that such approach can also be successful in team sports. Needless to say I totally disagree with that. Having worked as a coach developing young athletes and as a coach of senior athletes in a team sport I can definitively say that in order to produce a World Class team you need to have the talent in the team as well as people who have done thousands of hours perfecting their skills. You just cannot change an average Basketball player in his/her 20s in a World class handball player and vice versa, you cannot identify a tall guy/girl and within 4 years turn him/her into a World class volleyball player. Why not? Simple: because no matter how physically talented they are, it is unlikely they can make up in few years for the lost time of practice as compared to people who started their sport when they were children. If you believe that nobody in 4-5 years can become as good as Lionel Messi having never played football, then you are part of my club. I am not going to write about this issue in this post, but I promise will write more as talent id-ing is really an interesting field, and I am passionate about its proper applications at the right age group and understanding also the limitations in the possibilities of talent transfer in particular in some sports. 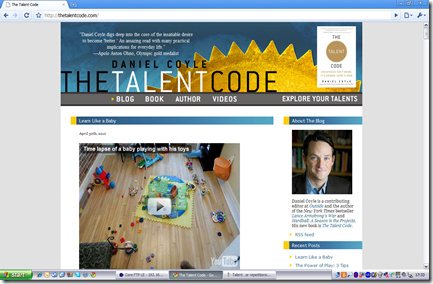 I have recently come across Daniel Coyle’s blog, and it is a refreshing read proving that talent alone is not enough and in many fields it is possible to reach success using a variety of training coaching methods, motivation and coaching. Most of all he talks about the importance of deliberate practice when an incredible number of repetitions are performed which allow someone to become a master in a specific field. I have ordered the book and I am looking forward to read it, in the meantime, I am enjoying the blog which is plenty of useful examples in sports. Marco,Great post. Talent Code is a good read and has made me think as a S+C Coach how to best develop our athletes. Another book you may consider is "Talent is Overrated" by Geoff Colvin. These 2 authors perceived philosophies compliment each other quite nicely. This topic always starts a great debate in our office here. I look forward to your next post on this. Thanks Ian. I agree about Colvin's book a great one! What about Phil Dalhausser, the best beach volleyball player in the world? He started in his late teens as a club volleyball player in college; he did not play years of youth club volleyball like thousands of other volleyball players. Also, what about someone like the San Diego Chargers Antonio Gates who played college basketball, not football, but was drafted into the NFL and is now one of the best tight ends in history? It's not a matter of talent vs repetitions, but an argument that some skills and athletic qualities do transfer between sports, which is why Hakeem Olajuwon can grow up as a soccer player and become an NBA Hall of Famer. Brian,thanks for the comments and for reading the blog.I agree that some individuals possess skills which are transferable, however they have to train in the new sport either at an age which is optimal to transfer such skills. For example Olajuwon started playing basketball at 15 years of age. Dalhausser started to play volleyball in his senior year in high school…so still within an age when it was possible to "transfer skills" and catch up with the rest and become even better than them. What I am trying to say is that it is pretty difficult for someone to change sport at 25 years of age and become World Class in another sport, no matter how good they are (Michael Jordan? ).It is possible to transfer for some exceptional talents (1 in a million maybe) sometimes between 18-20 years of age. Later than that, I think it is pretty difficult in ball games. And all we need to do is to simply look at the history of the best players in the World in the ball games (Football, Hockey, Basketball, Handball, Volleyball) to find out that they have many years of practice under their belt.